I went shopping at "Daiso" and found these very cute Japanese style New Year envelopes called "pochibukuro". These envelopes are also used for gift money "Otoshidama" on New Year's Day in Japanese custom, very similar to our tradition of giving Ang Bao or Red packet during Chinese New Year. Therefore, I decided to use these Japanese style New Year envelopes to make lanterns for our coming Chinese New Year! Finally, I made this lantern successfully!! Hope you would like my lantern idea, and I wish everyone a Happy New Year! This is six petals flower lantern made with 18 red packets or Ang Pows. I've made the below video, step by step instructions to create this Ang Pow lantern to decorate our home or office for the Chinese New Year. The length of the string is up to your preference how you would like to hang your lantern. You can use gold string too. I surfed and found this interesting post on the internet. How to make an Ang Bao (we can use to hold $$$ money), using origami into a God of Wealth. This is so cute. Mid Autumn Festival in Singapore is also celebrated by beautiful lighting and the display of lanterns. Some hobbyist decorated their rotocopter with beautiful light, sharing the joy with the public at Chinatown. This is the display of lighting at Chinatown this year. 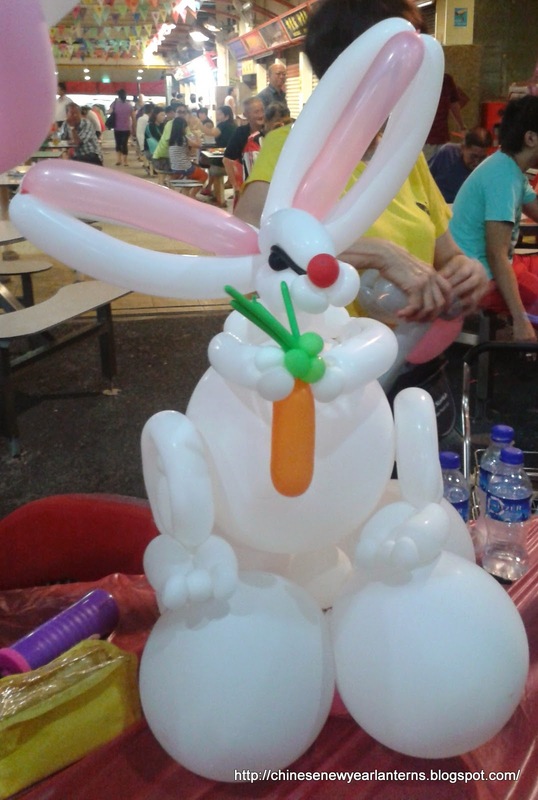 The below were the balloon sculpting of the moon goddess and her rabbit done by volunteers, at Redhill Market. Below is the lighting display at Vivo City. So adorable. I hereby wish everybody Happy Mid Autumn Festival! I just made this triangular Ang Bao Lantern out of the blue while I was playing with my red packets. I used three large red packets to form a triangular upper layer, and another three large red packets to make the bottom layer. Then I used three smaller red packets to make a "pendulum" in its centre. You can click to my previous post on my Diamond Ang Pow Lantern as a reference to learn to make this "pendulum"
After the lantern was completed, I was trying to give it an appropriate name. I did a research on its shape, and I learned there was a mathematical term on the geometry of the upper and bottom layer, called "tetrahedron". So if you are doing this Ang Bao Lantern with your children, you might also want to introduce to them this geometrical term "tetrahedron", when you can have fun and learn a bit of mathematics. Here is a video that I've created to show you how I make this triangular ang bao lantern, so you can also have something special for Chinese New Year. I've shared written instructions on how to make this Ang Bao Lucky Star with only ten red packets. 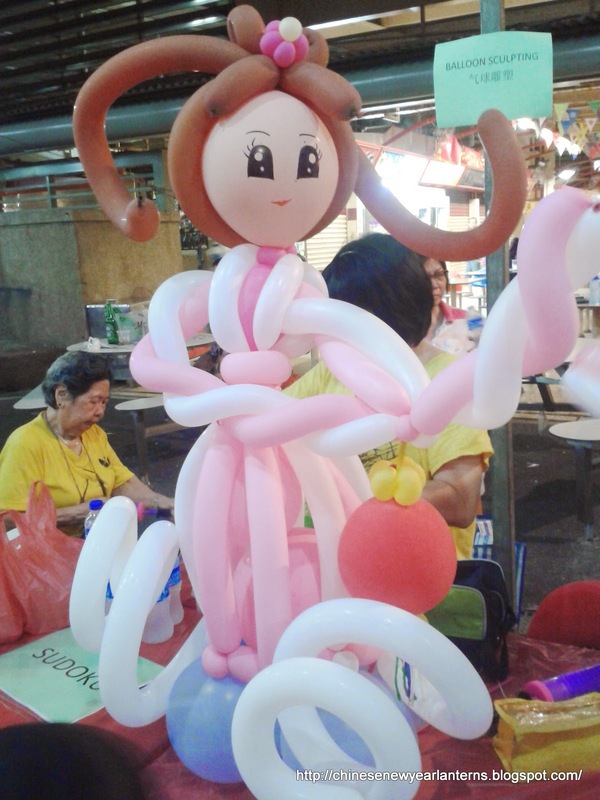 I've just created a video to show you how I made this Ang Bao Lucky Star. Now you can have a better picture of the process it is being made, so you can do this simple-to-make Chinese New Year handicraft with your kids to decorate your house for this coming lunar new year! Wishing everyone good health and prosperity, Happy Lunar New Year! I guess this board tells us the theme for this year of the horse "Galloping to Prosperity"
Chinatown Chinese New Year Celebrations 2014 Official Light-Up and Opening Ceremony will be held on 11 January 2014, at New Bridge Road and Eu Tong Sen Street. If you are a tourist to Singapore for the first time, you can take the MRT and alight at Chinatown Station or Outram Park Station.